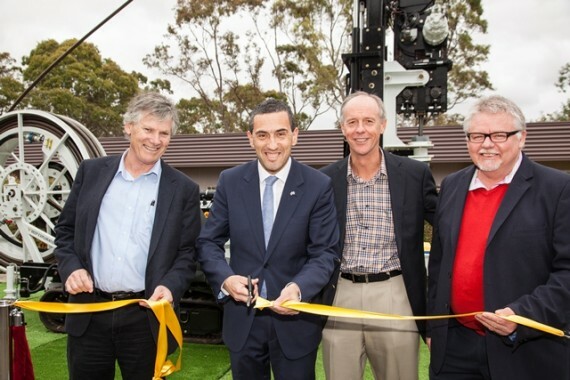 A prototype of the world’s first Coiled Tubing Drill Rig (CT Rig) for mineral exploration, a technology that could lead to a surge in exploration activity, will be launched in the Adelaide Hills today. The prototype CT Rig will be commissioned by the Adelaide-based Deep Exploration Technologies Cooperative Research Centre (DET CRC), established in 2010 to find more cost-effective methods of mineral exploration under deep, barren cover rock. The launch of the prototype CT Rig will be the key highlight of DET CRC’s Annual Conference held at the Brukunga Drilling Research and Training Facility in the Adelaide Hills. DET CRC Chief Executive Officer Richard Hillis said the CT Rig promises to significantly reduce the time and expense associated with drilling operations to find new mineral deposits. “The launch of the prototype CT Rig comes at a vital time for the mining industry,” he said. “More than ever, we need to find cost-effective methods of minerals exploration. Currently, 80% of Australia’s minerals production comes from mines that were discovered more than 30 years ago, yet more than 50% of Australia’s export income comes from mining. Indeed, based on current reserves, resources and rates of exploitation, half of Australia’s existing major non-bulk commodity mines could close down within 7 to 18 years. Instead of drill rods, the CT Rig uses a continuous reel of tubing which eliminates manual handling of drill rods (thereby greatly increasing safety) and maximises the time the drill bit is actually at the bottom of the hole drilling. The prototype rig launched today currently uses steel tubing, but DET CRC will experiment with innovative tubing materials such as carbon fibre. The CT Rig is also much smaller and lighter than conventional drill rigs and will use a motor at the bottom of the hole as opposed to at surface, all greatly reducing the consumables (e.g. fuel) costs and environmental impact. Professor Hillis said the CT Rig would be combined with other technologies being developed by DET CRC including downhole sensors and Lab-at-RigTM technology, to further enhance the productivity of mineral exploration. “The majority of Australia’s existing mines are located where mineralised basement rocks are outcropping or shallow,” he said. “In order to ensure the future of mining in Australia, and in all heavily explored countries, new technologies must be developed to explore to greater depths in the vast, prospective areas where mineralised basement is hidden beneath deep, barren cover rocks. Managing Director of Minex Consulting and leading industry figure, Richard Schodde, said a vibrant exploration scene was essential for the long-term future of the mining industry and new deposits continually needed to be found to replace the old ones. Mr Schodde, who will be the keynote speaker at the DET CRC Annual Conference, said the current level of exploration spend is linked to commodity prices. “Mining companies are under extreme pressure to lower costs and improve operating margins. Cutting back on exploration can save the company money in the short term – but at the expense of putting its long term security at risk,” he said. “Junior companies, which make up nearly half of the total exploration spend in Australia have also had to cut back on exploration because of difficulties in raising equity from shareholders. Underpinning both cases is a perception about the risk/reward for exploration. “At the moment investors are risk-averse, and the exploration industry (for both major and junior companies) is generally not good at identifying and making the business case on the likely rewards accruing from their exploration programs. Mr Schodde said the “the more you drill the more you find”. “In combination with real-time sensors (which are being developed by the DET CRC), the Coiled Tubing Drill Rig would radically speed up the rate of target testing,” he said. “The ability to learn as you go by getting instant feedback on the ore grade and mineral potential of the local area will help quickly guide the company to zero-in on the deposit. The CT Rig will be officially launched by the Minister for Mineral Resources and Energy, Hon. Tom Koutsantonis, MP, at 12 noon on Thursday 21 November at the DET CRC Drilling Research and Training Facility, Pyrites Road, Brukunga. DET CRC was established in 2010 under the Australian Government’s CRC program. The CRC program provides funding to build critical mass in research ventures between end users and researchers to deliver significant economic, environmental and social benefits across Australia.